It was 10 days after she first arrived at the Syrian-Jordanian border that Marwa’s* patience ran out. She had left Damascus, the capital, on 25 May with her five young children and her husband, who was just out of detention and still weak from the beatings he underwent there, she said. The rebel Free Syrian Army (FSA) took them more than 100km, through insecure back roads, to al-Hayt crossing on the southwestern edge of Syria, only to learn that the border was closed. The family spent three nights in Ma’ariya village before getting word the border had reopened. They tried again, but the Jordanian army told them there was only one bus available to take them safety to the other side. That day, the bus was only taking people from Tal Shihab crossing, several kilometres east, a 10,000 lira (US$100) ride they could not afford. “Come back tomorrow,” Marwa recounts being told. She spent the next six days going back and forth to the border, where she waited 12 hours for a bus that never arrived. During her wait, she listened to constant shelling in nearby Shaghara town. “One day they take 20 people; then for two to three days, they take no one,” she told IRIN. Turned back to the village time after time, they slept in people’s homes, in a school-turned-shelter and, when there was no space, on the streets in the cold. On the 10th day, she and some 50 other women had had enough. Then, despite warnings from Syrian rebels and Jordanian officials, they picked up their bags and their children and started walking. After they descended hundreds of feet in elevation and crossed an empty river bed by foot, Jordanian border officials finally let them in. Marwa and her family were among 244 Syrians who made it to the UN registration centre in Jordan’s Za’atari refugee camp that night, on 4 June. They were welcomed by an army of aid workers accustomed to much larger numbers. “At anything less than 2,500 new arrivals per night, we don’t consider ourselves busy,” said one man distributing blankets, referring to earlier levels which have dropped dramatically in recent weeks. Aid workers do not know what to make of the current trends. 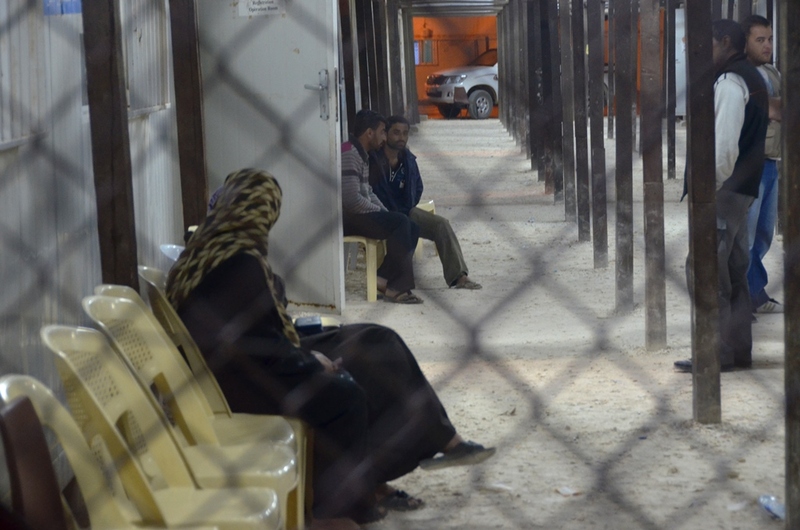 One week in mid-May, the camp saw almost no new arrivals - attributed at the time to security measures during two international conferences in Jordan. Since then, arrival levels have fluctuated, but remain in the hundreds of entries per night, far below earlier averages of 1,500 to 2,500 per day, if not higher. The period without entries was “blown out of proportion” by the press, Anmar Alhmoud, the Jordanian government’s spokesperson on Syrian refugees, told IRIN last week. Jordan continued receiving injured people throughout, he said, insisting the country’s open-door policy has not changed. Jordan’s King Abdullah II “never said anything about closing the border… We are obliged to accept all those who seek refuge,” Alhmoud said. The Jordanian Armed Forces have diverted hundreds of soldiers from their regular duties to the refugee rescue effort. Soldiers pick them up from remote, desert areas so harsh even Bedouin tribes do not live there, including the nexus between the Jordanian, Syrian and Iraqi borders, which is home only to sand and smugglers. In some cases, the army feeds and shelters the refugees in their barracks for days until transport becomes available, as many of these areas can only be reached with military vehicles. But aid workers suggest that what first appeared to be a temporary closure is beginning to look like a longer-term reduction in refugee intake. "How many days are you going to leave us here? There are sick and pregnant women among us. We can’t wait anymore." One refugee at Za’atari, who had come to meet his mother, brother and sisters due to arrive from Tal Shihab crossing last week, said 300 people had been turned back that night, among them his family members. Observers say the government may have used May’s international meetings as a pretext to test international reaction to a border closure. So far, outrage has been limited. Still, he acknowledged the UN did not have enough information to fully explain the “slow-down” in the number of new arrivals. And while “there may be delays” in crossing the border, Jordan’s intake remains one of the largest in the region. During visits to the border, he said, UNHCR officials have never witnessed people waiting on the other side. As the number of refugees increases exponentially across the region, neighbouring countries, including Iraq and Turkey, have also been accused of not fully opening their borders to Syrian refugees. The European Union has turned away many Syrian asylum-seekers. But other factors may also be at play in the reduced flow of refugees into Jordan. A recent Syrian government offensive to re-take parts of the south has restricted access to some of the routes previously used by refugees, Harper and others said. The Syrian government now controls many areas along the border previously controlled by the opposition; as such, the FSA has had more difficulty helping people get to the border, analysts said. In addition, according to Harper, at least 15 villages in southern Syria have been completely emptied, with one-third of southern Dera’a Governorate’s original population now living in Jordan. As Walid Alkhatib, of the Center for Strategic Studies at the University of Jordan, put it: “There are not many Syrians left in the villages” along the border in the first place. This contradicts refugees’ testimonies. One elderly woman told IRIN: “Many people want to come here. They turn them back.” She traveled to Jordan to help her son cross the border; as a young, single man, he would not have been allowed in alone, she said. On 23 May, the imam of Syria’s Nasib Village, one of the main crossing points, told IRIN 10,000 people were waiting to cross the border. Harper warned that Syria’s neighbours needed additional support “so that they have the confidence” to keep accepting refugees. “What is happening at the moment is that Jordan is being used as a buffer zone or a shock-absorber for what is going on inside Syria,” he said. Indeed, some observers say the perceived change in policy was an attempt by Jordan to send a message to the international community ahead of an international appeal for more funding to support host countries, which was launched on 7 June in Geneva. Harper also advocated for more humanitarian support for Syrians within their own country so that they need not seek refuge in the first place. The presence of Syrian refugees has put an increasing burden on Jordanian services, especially water delivery. Some observers say the government, already fragile after large-scale protests in 2012, is under increasing pressure to limit the impact of the Syrian crisis on Jordanians. An April poll by the Center for Strategic Studies found that 71 percent of Jordanians wanted the government to stop the flow of refugees. According to Alkhatib, head of the Center’s polling department, the government has become “more selective” about who enters the country. A Jordanian military source told IRIN there were no limits on the numbers or locations of Syrian refugee entries, but confirmed there were certain conditions for entry. Government officials have repeatedly said that Palestinian refugees in Syria or Syrians without documentation, especially young, single men, are not allowed to enter Jordan. Other sources close to the government said entry criteria exclude asylum seekers belonging to Syrian President Bashar al-Assad’s Allawi sect, as well as anyone with past affiliations with the Syrian Army. Under international law, anyone with a genuine fear of persecution has the right to seek asylum. One young female refugee from Um Walid village in Dera’a told IRIN that after reaching the Jordanian government registration centre in Rabat Sarhan, Jordanian officials sent her and others back on a bus to the Syrian side of the Tal Shihab border crossing, on the basis that her brother was using forged identification and had a suspicious travel history. When she returned days later, alone, she entered successfully. “We are tortured depending on their mood,” she said of Jordanian officials. She spoke to IRIN while waiting to register with UNHCR in the middle of the night. Refugees at the registration centre in Za’atari camp consistently told stories of having to wait days before being allowed to cross. One group of Syrians at the Nasib crossing on 4 June were initially told there were no entries that day, several refugees told IRIN separately. As they waited, a shell from the Syrian side flew overhead, landing 10m in front of them. Another landed shortly afterwards within 50m of them. They dropped everything and ran; some hid under a sand ridge, and others tried to cross the riverbed. The Jordanian army then brought all them across the border and even went back for their bags. In another case, recounted by a refugee, after 15 people were let in at a crossing point, the 16th was turned back and told that capacity had been reached for the day. In other cases, refugees said, Jordanian officials told them they required a minimum of 50 people before they could bring a bus to take them across the border.